The gaffer – also credited as the Chief Lighting Technician (CLT) or “juicer" – is ultimately the head electrician in the electrical department. He is in charge of the placement of all the rigging and lights on the set. The gaffer answers directly to the cinematographer of the movie as part of a crew that also includes the camera operator and key grip. His direct assistant is called the best boy. A good gaffer, especially one who operates as the ‘Lighting Director', knows the lights, from the types of light sources available, available power supply, lighting ratios, to the color temperatures of all types of lighting conditions. Whether daylight or tungsten, he should know how to correctly balance the lights accordingly. He should also be familiar with what type of gels, diffusers and light modifiers may be used in order to manipulate any lighting condition the director of photography (DP) sees fit. 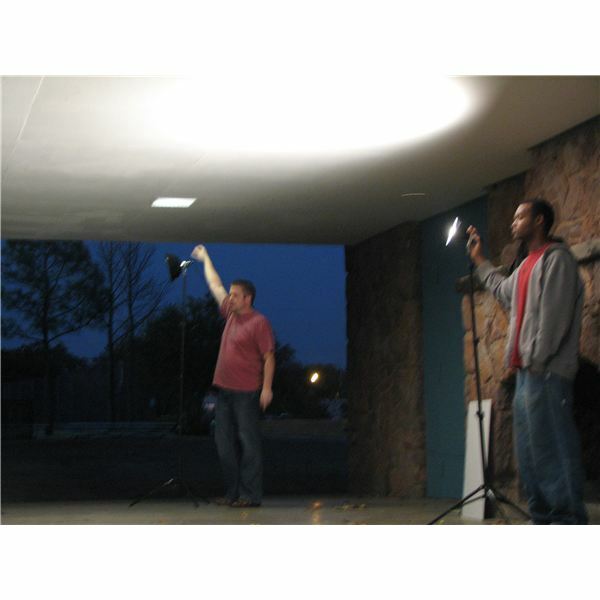 Generally, it is the DP that controls the creative aspects of the lighting design on the set and, therefore, the gaffer acts more as a technical crew member. They usually have their own equipment and trucks and may then serve as a contracting service company on the production. The producer or production manager, in consultation with the DP, hires the gaffer for the film production. If the production is a larger one, with a larger budget in which more crew is needed, he runs his own crew. Other than the best boy, his crew also consists of a number of electricians or electrics (aka ‘sparks’) working below him. On the set, he works closely and reports directly to the DP. The gaffer also works closely with the grip department, the physical laborers that move and/or set up equipment, such as the heavy lights and modifiers and rigs, dolly tracks, and so forth. He should not to be confused with a key grip. A gaffer oversees lighting and electrical issues while the key grip oversees the laborers that move and set up equipment, etc. on the set. The origin of the term ‘gaffer’ is unknown. However, it is believed to have originated from the actual gaff pole, the pole that was used to adjust the lights and modifiers or flags located on a grid above the set/stage. Others believe the term derived from the gaffs, the poles on a ship, for a good bit of the early gaffers on a film set were actually off-duty sailors. This is an interesting theory since the term ‘best boy’ derives from a sailing term, one which the captain would deem the best of all his crew and would serve as his right-hand man. Today, the best boy operates in much the same way. Film Art: An Introduction (Fourth Edition). Bordwell, David and Thompson, Kristin. Images included are part of author's private collection.